Logiblocs is an "electronic discovery system" that consists of colour-coded blocks, each with a circuit-board inside that performs a function. Some of these blocks record, some amplify and some are in-built speakers. By plugging these blocks together in different combinations, children can create all kinds of contraptions including burglar alarms, lie detectors and flashing space stations. Logiblocs toys provide a great way for children to understand the world of technology around them - and because each product comes with simple, step-by-step instructions, children can use Logiblocs toys at whatever level suits them best. This ensures that not only do children have great fun playing with them, but there is also a definite sense of achievement in doing so too. Logiblocs toys are said to have sold over 3-million units around the world since this British company was created in 1996. 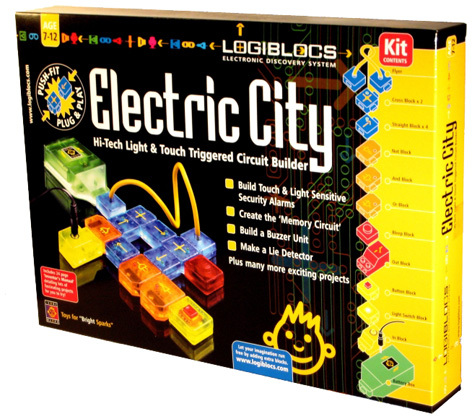 Particularly popular is the Logiblocs Spytech Kit that introduces children to computer science and electronics in a highly creative way. The SpyTech kit enables kids to create four different kinds of intruder alarms which can keep them entertained for hours. Fans of Logiblocs toys may also like to check out one of the company's other creations: Logimen. These little robots reside in LogiCity (in the year 4371!) and have strong magnetic feet, detachable heads and flashing eyes. The Logimen consist of a policeman, a criminal, a civilian and an agent - and link with other Logiblocs parts for maximum play value.